Need that special something to finish off your patio? Look no further than the style you get from the Woodard Colfax Bench Set. Enjoy a great bench that stands up to the most extreme weather because of the extruded aluminum construction. You'll also get a Trellis Round End Table that would look great right next to this conversation piece. The style is something you can personalize as well because of the variety of powder coated finishes that are available to select from. 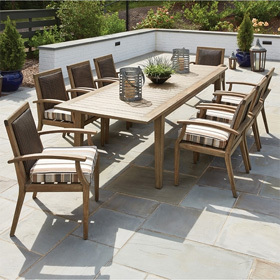 Enjoy the outdoors for years to come with this Bench Set that beckons you to your patio as often as possible. Bench 47"W x 28.5"D x 35.5"H 57 lbs. Table 18"L x 18"W x 17.25"H 15 lbs.